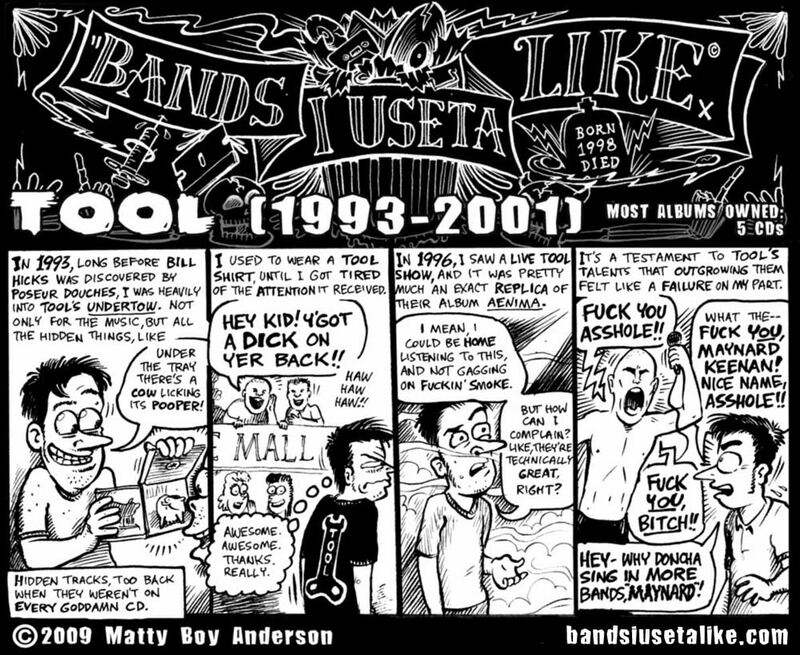 From BANDS I USETA LIKE #1. 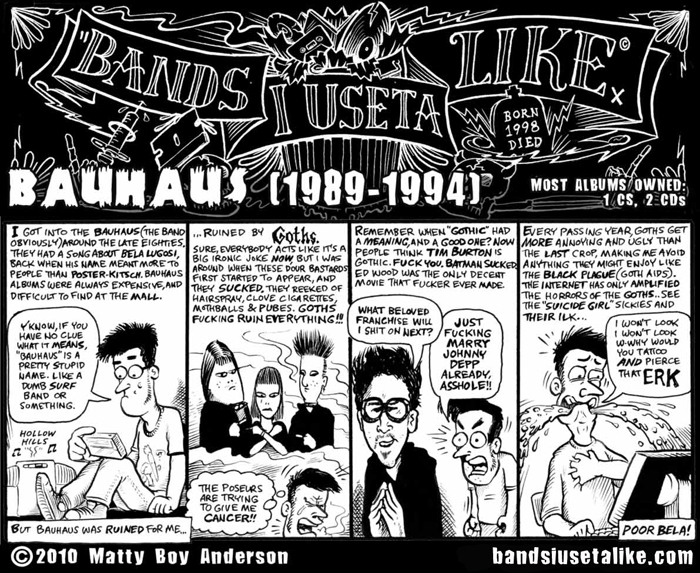 There are a handful of things I’d change if I were to redo this strip. 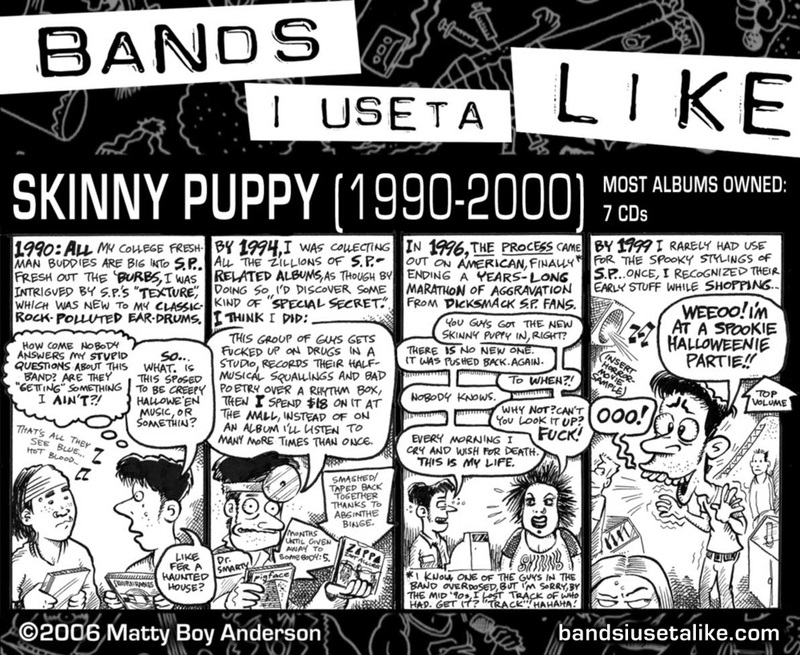 I’d rephrase what “intrigued” me in the caption atop the first panel; my sarcastic quotation marks on “texture” are easily mistaken for a misspelling of an actual Skinny Puppy song, “Testure”. I would reevaluate my appreciation for them, because these days I find myself turning to their music regularly, like a balm. 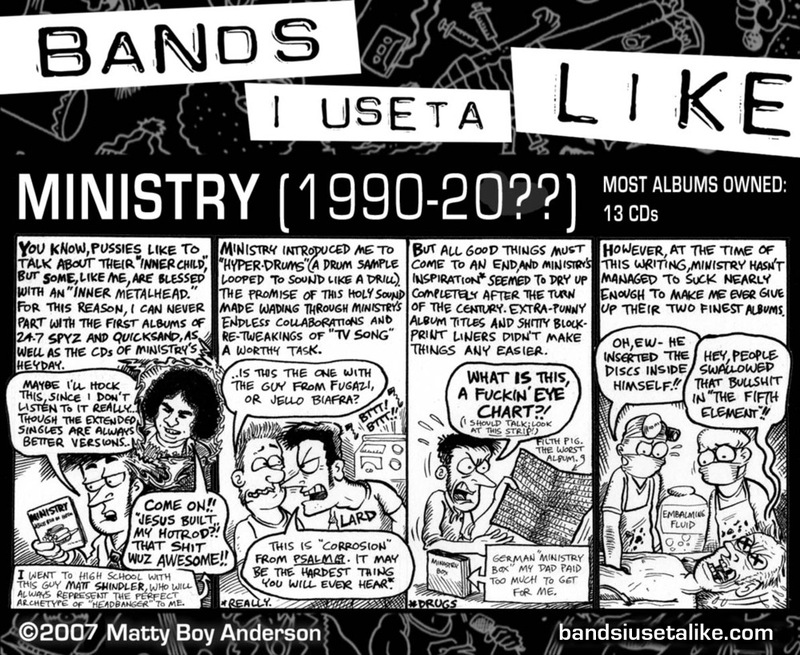 I swear to god I thought I did a strip on Laibach. I had to look all over to make sure I didn’t. I can see it in my head! I can see it! I’ve never found a version different from the one posted. Did I imagine it? 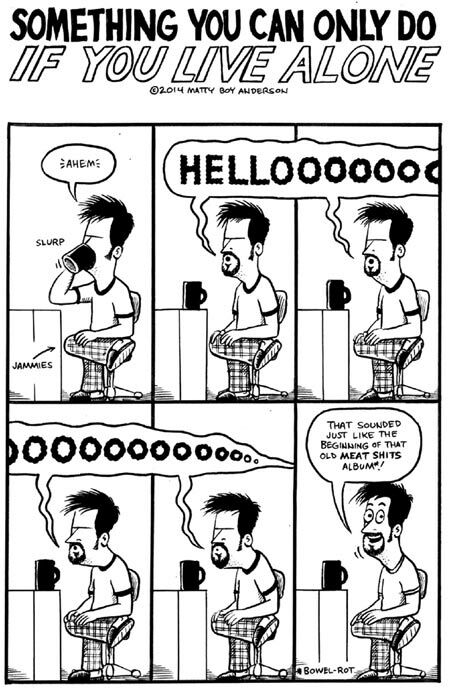 Did I hear a remix, or was the CD skipping? Two, another vivid memory: a high school buddy purchased a Laibach album, back when they came packaged in cardboard “longboxes”. He said the inside of the longbox was lined with swastikas, which prompted a stimulating discussion about the peaceful origins of the symbol. And he was Jewish! I have found no evidence online that this packaging ever existed. What the fricasee, did I goddamn dream it? What would THAT mean? Now you share my special level of Hell. I’m counting this as a strip. 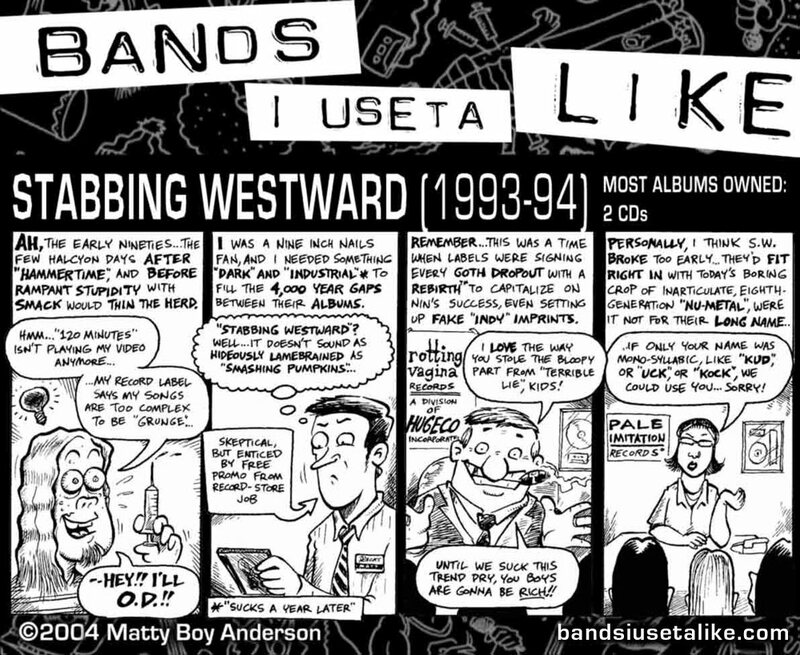 Tagged as 1990s, 1992, Bands I Useta Like, industrial, Laibach, music, underground, Wax Trax! In honor of the birth of the great Bela Lugosi. Note: the girl in the middle in panel 2 is making the “obfuscate” gesture that pretend vampires make when they want me to sucker punch them. Credit where it’s due: I rag on Trent Reznor because I know he’s capable of things like “La Mer”, from The Fragile. I intended to back this up for you with a video link, but the relevant album version has been scrubbed from YouTube as far as I can tell. Sorry. 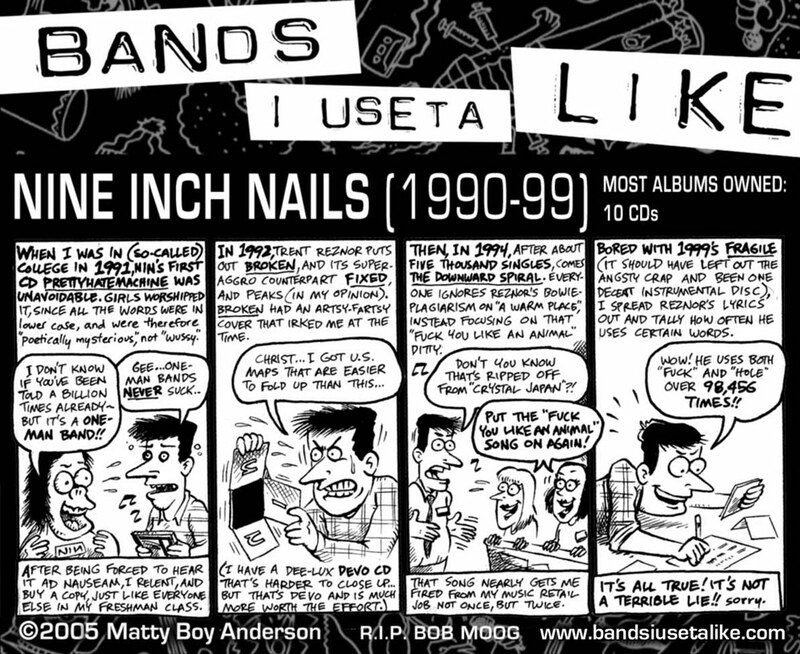 Tagged as 1990s, comic, comix, industrial, Mike the Pod, Nine Inch Nails, strips, Trent Reznor, Wax Trax!